Have you heard the buzz about NPR? We're here to break it all down for you with everything from what it is and how it's used to the benefits it has throughout various industries! NPR stands for non-photorealistic rendering. The purpose of NPR in VUE is to create images that look like handmade illustrations, drawings, or paintings, as opposed to images that are elaborated to look like a standard 3D render (with a computer-generated look), or like a photograph of an actual place or object. Some NPR techniques process flat images, where for each pixel, there is only one color. This can be used to detect edges and draw contours of objects, for example, but it's often not very precise. Some photo filters that you find in smartphone apps can do this. VUE also includes two simple effects called "Dot Shader" and "Halftone Shader" that only process the color channels of rendered images to fill their surfaces with dots or ridges, and whose radius and thickness depends on the lighting. These techniques can be used to create pop-art effects. Another NPR technique, as applied in VUE, processes images containing additional information (given by the renderer), which allows for more precise drawings. For each pixel, there are several components – the color, depth, normal of the object, its ID (distinguishing it from other objects), the ID of the material used, etc. This allows you to draw strokes with different sizes depending on the depth of objects, with an orientation that follows the surface of objects, with a color matching the underlying object, etc. The ID of the objects and materials enable an accurate detection of outlines. 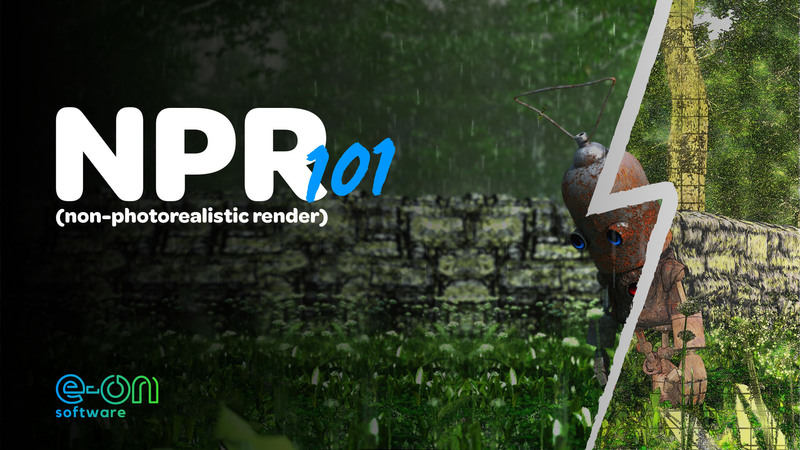 Finally, we can mention another kind of NPR method that is most commonly used in video games and in other 3D software. This method applies the effects directly to the material level, meaning that it directly changes the final rendered result (lighting, color, edges, etc.). What benefits does NPR rendering in VUE provide the user? NPR rendering allows the user to easily create illustrations of objects and scenes. Of course, if you start a project from scratch and need a single image, it's probably faster to actually draw the object by hand than to create a 3D model of it and then generate an NPR image. But, if you need several images (for animations, different points of view, etc. ), or have the 3D model, then it becomes interesting to use NPR rendering since the illustrations are generated with little effort. In VUE, the NPR module allows you to define how each line that represents the edge of an object are drawn to imitate different styles of drawings. The main settings include; the precision of the tracing, the type of line to mimic several tools or supports (pen, pencil, watercolor paint, paintbrush, marker, etc. 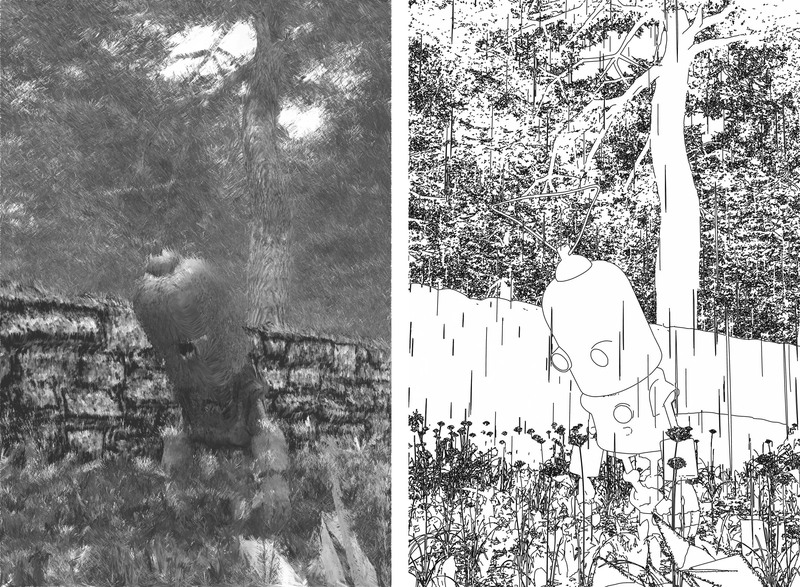 ), arbitrary distortions, and duplication's of lines that can be used to create sketches, for example. The second feature of the NPR module is the use of shaders that define how the whole surface of the image is filled. 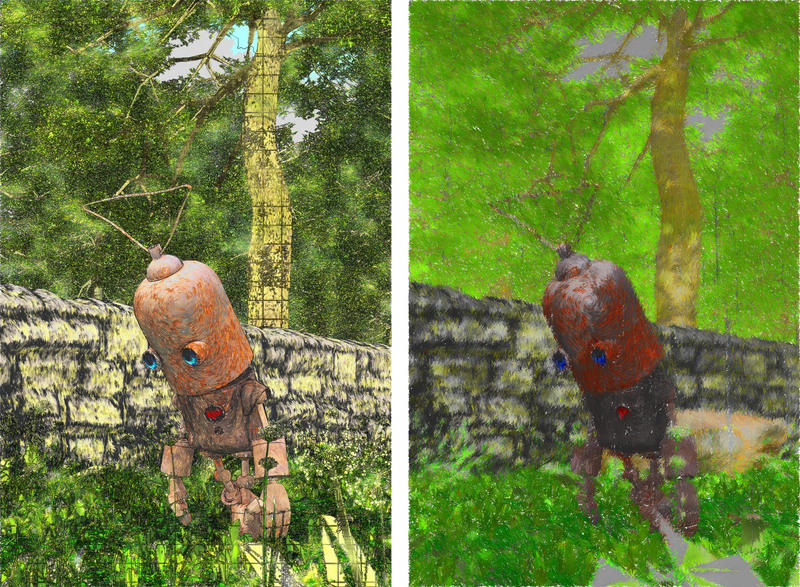 A well-known feature is the "Toon Shader", where the shading uses a limited amount of flat colors. 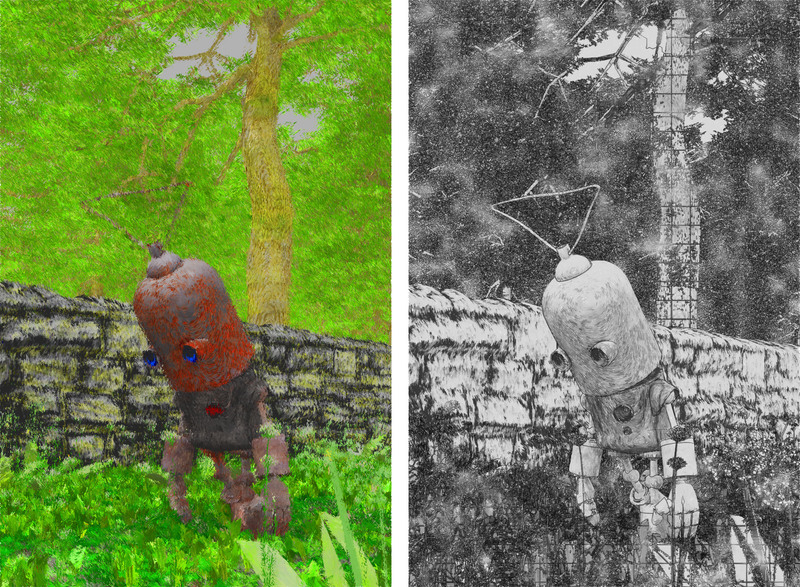 Another example is the "Texture Shader" that uses scanned images of different levels of gray. VUE includes a preset with hand drawn grays, but the user can replace them with anything. There is also the "Dot Shader" and "Halftone Shader" that’s used to create pop-art effects. The most complex and useful feature is the "Hatch Shader" that fills the image with strokes and whose type can be defined for the edges, as described previously. For example, filling the whole image with short and thick paintbrush strokes can produce a sort of impressionist painting. On the other hand, filling it with thin but longer strokes of penciling produces a shaded drawing. What are the industries that use this kind of rendering (i.e. architecture)? Is it possible to use it in other industries (i.e. gaming, movies, etc.)? It can be used by design or architectural agencies to illustrate the creation process of an object or building that can be used for different activities (i.e. marketing campaigns). Industries may prefer to use a generated NPR render because the actual drafts may not satisfy the desired look of the advertisement (quality, fidelity to the final object, angle of the view, etc.). With an NPR render, and when the final 3D object is available, it's easy to create an artificial draft or drawing and adjust the point of view, precision of strokes on the object, etc. It can also be used in movies and in video game cut scenes – mostly with the toon shader associated with accurate outlines. Other shaders, like the hatch shader or outlines that imitate sketches, may create animations that scintillate because the strokes vary a little between each frame, which may be the desired effect. How much time does it take to render photo realistic artwork in VUE/MicroStation? In VUE, the rendering time is divided into 2 passes. First, the standard realistic render is generated by saving additional information for the NPR "engine", then the NPR is computed using this information. The second pass is often short, and can be regenerated without recomputing the first pass, which enables you to change the NPR settings and see the result quite rapidly. Regarding the first pass, its duration depends on several parameters – the image size, the scene complexity, and the render settings. It can be long in some cases, but since NPR often removes details in the final lighting/coloration steps (if the toon shader or the hatch shader are used, for example), it's not necessary to push the render settings to have a high quality. Anti-aliasing can also be disabled most of the time, so the first pass can be made faster too. There you have it! Interested in putting these NPR capabilities to the test? Subscribe to any one of our three solutions to get started!